Dr. Who — the BBC's very own epic. science-fiction hero. So. all throughout Britain, one-TV families had a tussle over skipping an hour of Christian miracles for a retrospective look at the 13-year rise of a cantankerous eccentric into a cult hero. Dr. Who is 750 years old, has two hearts, wanders through time and space in a commodious police call box, and is seen weekly by about 12 million, an audience that usually makes it the BBC's most popular drama offering. Convention says a sizeable portion of the audience (60-per-cent adult, 40-percent children) watch the Doctor's exploits from behind a sofa or through the cracks of distant doors, shivering with delicious fright. That's because Dr. Who resembles, in his duties, a Matt Dillon of the universe. "It's the cowboy syndrome," admits producer Graham Williams. "The Doctor is the guy in the white hat who rides into town and plugs the guy in black ... even if the baddie does have tentacles." Not just tentacles but an infinite variety of death rays, a stream of intergalactic evil geniuses, and assorted villain gladiators, including a very special foe known as the Daleks. But even the most inventive terror doesn't explain the program's survival through more than 400 time-travelling episodes with four Dr. Whos, nine plucky female assistants, not to mention sales to two dozen other countries. The Commonwealth looms large in the sales abroad — Australia, Hong Kong and Zambia are the three biggest buyers. Dubai edges Canada into fifth place. "It frightens the life out of the Dutch. French and Germans. They won't touch it," says Tony Cash, producer of the BBC's retrospective. "They think it's too horrible for children." "Mind you, they don't get the humor." Much of the humor derives from the Doctor's eccentricity. It begins with the costume devised two years ago by the current Dr. Who, actor Tom Baker, who was Rasputin in the film Nicholas and Alexandra but who now contrives to resemble Harpo Marx. A floppy, platter-sized black hat. a 17-foot-long multi-colored scarf and a greatcoat with yoyos in the pocket (plus the ever-handy Sonic Screwdriver) are not the trappings of your average U. S. television hero. Neither is a breezy familiarity with Great Men ("As I said to Galileo at the time"), an instant grasp of problems of relativistic astrophysics and an active concern for good manners and compassion. Such unusual attributes attract unusual fans, such as Alan Thompson, professor of the economics of government, who wrote recently about the "creative and exciting manner" in which Dr. Who introduces morality. "In every series, right always, in the end, triumphs over wrong. At a deeper moral level, good always triumphs over evil." Herein lies a special appeal of the program, in its ability to operate at two levels. While the intellectuals are soaking up the doctor's musings, the kids revel in the dispatching of a giant rat in the sewers of Victorian London. The show doesn't give actors much scope (special effects come first) but the script writers love it, because any period in earth's history is available ... or any fantasy world they care to invent. "The audience never knows who is going to do what to whom and with what," says producer Williams. Nor do they much care, because they know the doctor will triumph finally, despite his mistakes and interference from the Time Lords who exiled him to wander through time and space. So regularly has Dr. Who vanquished the public's favorite villains — tinny-voiced, armor-plated tyrants known as the Daleks — that the BBC claims they're no longer credible as a foe. "Anyway, they're terribly boring conversationalists," huffs Williams, since the Daleks' constant refrain is "Ex-ter-mi-nate." Eventually, as a Times writer said, the program will get you in your phobia — fire, suffocation, radiation sickness, falling from great heights, enormous spiders, giant maggots, totalitarian regimes or man-eating plants. But not senseless detective-story violence: Tom Baker gets worked up over heroes like James Bond or Kojak. "One wouldn't want to have them around for tea," Baker told a British interviewer. Caption: Tom Baker is latest Dr. Who, shown here with a Dalek. APA 6th ed. : Calamai, Peter (1977-05-17). Dr. Who a cantankerous cult hero. The Province p. 24. MLA 7th ed. : Calamai, Peter. 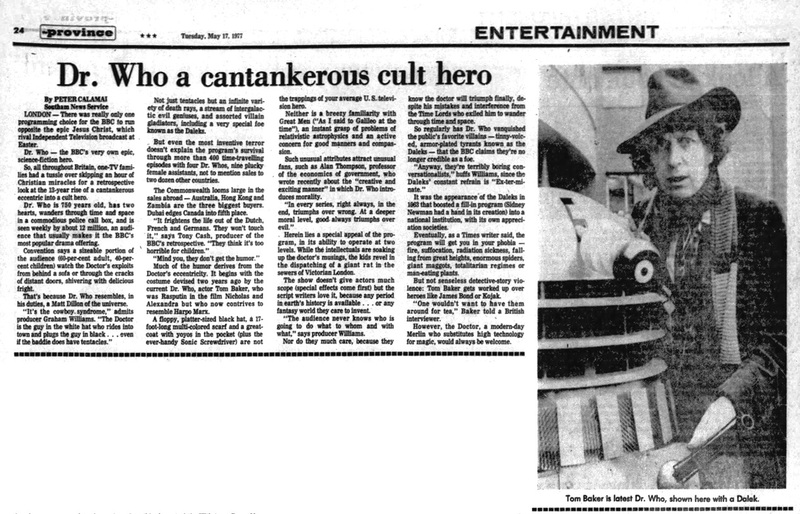 "Dr. Who a cantankerous cult hero." The Province [add city] 1977-05-17, 24. Print. Turabian: Calamai, Peter. "Dr. Who a cantankerous cult hero." The Province, 1977-05-17, section, 24 edition. This page was last modified on 14 February 2019, at 00:26.